This recipe is in my Treats category, because it’s excellent as a dessert, but in reality, it’s super healthy! Few ingredients, no added sugar, quick to do, it's the perfect snack to give you energy! These energy balls are vegan & gluten free. The use of Nutbrown granola makes them super crunchy. Plus, they are customizable using your favorite granola! Plus : using a food processor is optional! In a heatproof bowl, put the dates. Boil the water. Cover the dates with water and soak for 5 minutes. Drain. Add all ingredients, including dates, to the food processor. * If you do not have a food processor, you can chop dates and granola, use ground chia and mix everything with a wooden spatula. Optional : Sprinkle with granola, chopped cashews or cocoa. If you do not use a food processor, the balls will be imperfect, but more crunchy! These are sprinkled with finely chopped cashews. 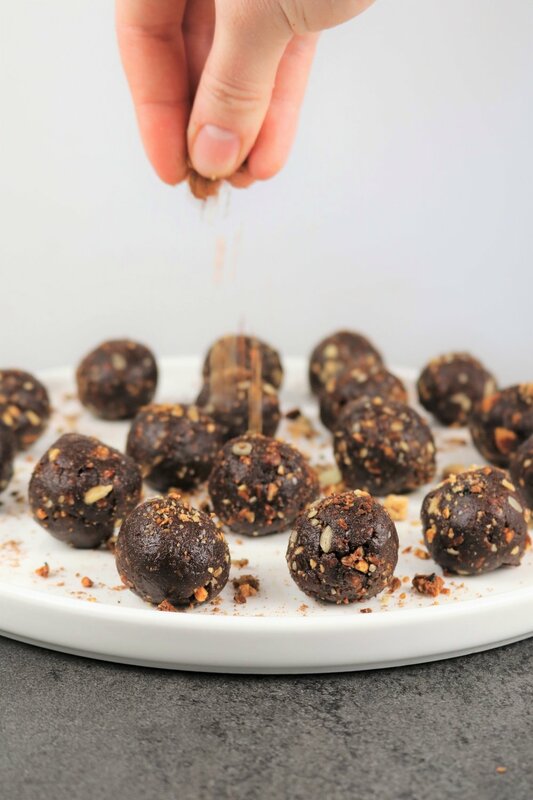 These balls were formed with a mixture from the food processor and are sprinkled with granola.